Rating: 5/5 (Although I feel a 10/5 would be more appropriate!). Official synopsis: "When Ty witnesses a stabbing, his own life is in danger from the criminals he’s named, and he and his mum have to go into police protection. Ty has a new name, a new look and a cool new image – life as Joe is good, especially when he gets talent spotted as a potential athletics star, special training from an attractive local celebrity and a lot of female attention. But his mum can’t cope with her new life, and the gangsters will stop at nothing to flush them from hiding. Joe’s cracking under extreme pressure, and then he meets a girl with dark secrets of her own. This wonderfully gripping and intelligent novel depicts Ty/Joe's confused sense of identity in a moving and funny story that teenage boys and girls will identify with - a remarkable debut from a great new writing talent." I have just finished what has to be one of the most amazing reading experiences I have ever had. I like my fantasy, but there is nothing fantasy about When I Was Joe. It's gritty, dark, but above all, realistic. It deals with the issues of knife crime (focusing on London) and the consequences that befall all parties involved. Right from the beginning chapter, I knew that this was something special, and the further the book went on, the more that point was proved. Ty/Joe is one of the most amazing characters I think I have ever had the fortune to read about. After witnessing a fatal stabbing, he gives evidence to the police, putting his life in mortal danger. A petrol bomb attack forces Ty and his mum, Nikki, from their flat in London and they enter into the Witness Protection Programme. Ty is given the new identity of Joe, and he couldn't be any more different from Ty. Everyone at his new school thinks he's cool, for the first time in his life, he isn't seen as a loser any more, and all the girls flock to him. He finds something he really enjoys and is good at - athletics - and begins training under the supervision of strong-minded, determined Ellie, a paraplegic gearing up to enter the Paralympics. Life as Joe isn't so bad. But then things start to go wrong. His gran is injured - attacked by the people trying to flush Ty out. The people who he gave evidence against - it just so happens to be a very powerful criminal family. He's suspended from school after a fight and sustains broken ribs. The police won't let him go to see his Gran in case the hospital is being watched. When finally he does, it all goes wrong and Ty wonders whether he'll ever be able to have a quiet life ever again. A hugely powerful book. Entrancing and beautifully written. I love the way that things are hidden - what Ty/Joe truly witnessed - until the very end. How there are secrets that even Ty/Joe refuses to face. Theres love and hate. Safety and fear. Anger and sadness. Everything you can want in a book. I cannot begin to tell you the impact this book has had on me. Seriously one of the best books I have ever had the pleasure to read and I cannot thank Keren David enough for writing a book to beautiful, so captivating and real. 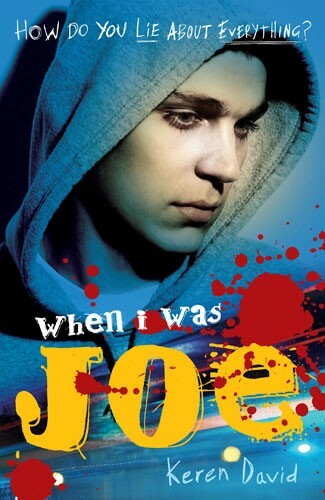 Books don't often make me cry, but I truly sympathised with Ty/Joe, and felt the emotions he was going through. Towards to end frustration was at an all-time high, and to be honest I felt the prickle of tears. A beautiful book that I fear I will never be able to praise enough. Thank you to Fabio Grandi at Frances Lincoln for sending me the copy. Very VERY excited for the next book about Ty/Joe, Almost True, out next month! Make sure you don't miss out! This one is one of my favourite books that I've read all year. I cannot wait for Almost True as well!